Last week (22/09/10) we had our annual sponsored walk and this year we were raising money for new laptops and playground equipment. 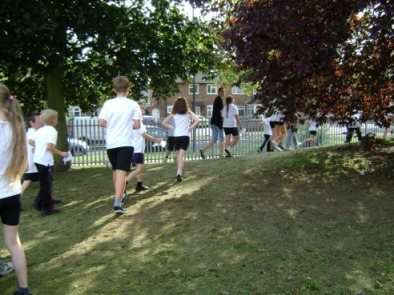 Everyone enjoyed walking round the school grounds, particularly the year 3s, with one year 6 completing over 30 laps. Last year we raised £1802 and this year we hope to raise more. We are the new Year 6s and are having a great time being the oldest in the school. We are the year 6 bloggers for this term and we will hopefully blog weekly! The new year 3s are enjoying their new school and are coping well with being in a bigger school. They are having a good time in class and learning loads and on the playground lots of year 4s are helping them.